Despite the loss in the last round, Sasa Jevtic earned his first IM norm thanks to the convenient rating distribution. He slipped though to the third place in the final standings. Talented youngster from FYROM Filip Pancevski and Paracin resident FM Mladen Milenkovic snatched necessary wins in the last round to fulfill their own six-points IM norms and tie the first place at the tournament. Pancevski was declared winner on better additional criteria. The top seeded players didn’t force too much and allowed FMs to fight among themselves for the norms. Boroljub Zlatanovic was in good position to stay on the top, but he couldn’t recover after losing to Jevtic. Mihailo Vujic played in a series of events prior to Paracin and finally run out of steam, dropping a couple of perspective games. 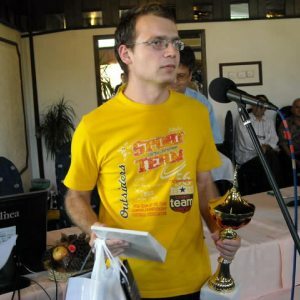 Selected games are bellow, full PGN and more photos can be found on the tournament page hosted by Serbian Chess Federation.